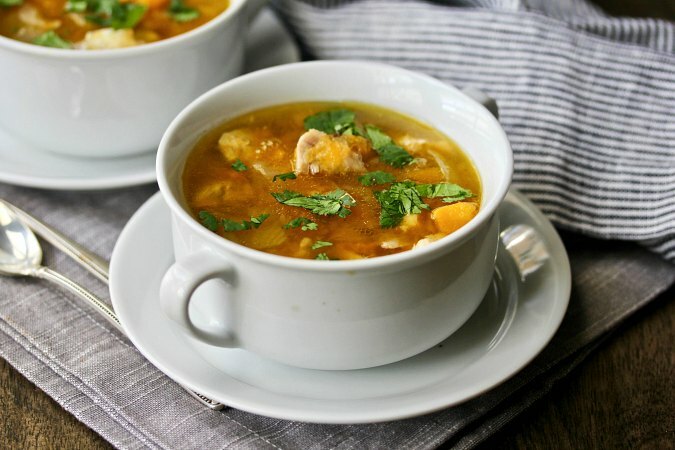 This soup is super easy to make. All you need is a sheet pan, a large saucepan, and a potato masher (plus a peeler and a knife if you are going to peel and cube the squash yourself). Butternut Squash and Ginger Soup. They both have pureed butternut squash. This time, I wanted something chunkier and a little different. To get a chunkier soup, you add the roasted onions and squash to the already prepared broth, and mash them roughly with a potato masher. You want some of the squash to add its sweet flavor the broth, but you sill want to have pieces of squash and onions. 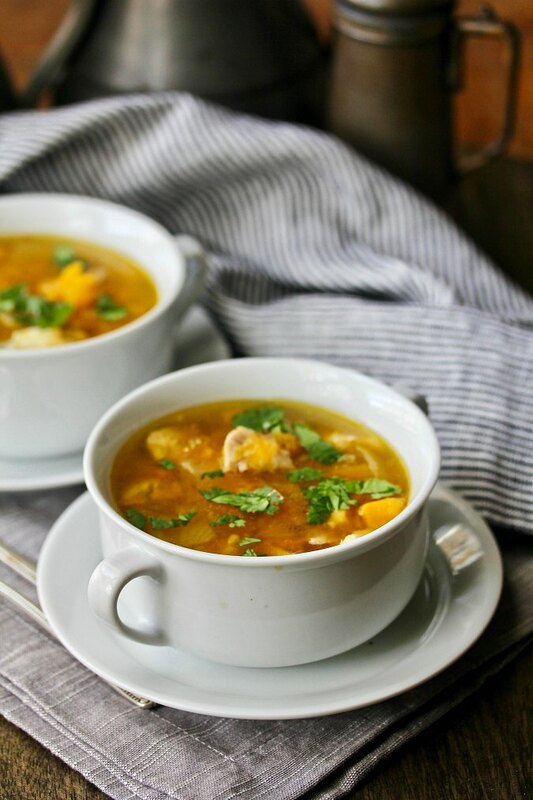 Once you've slightly mashed the squash and onions, you add the shredded chicken to the soup, season it with some cumin, coriander, and a little lemon juice. Garnish this soup with some chopped cilantro or parsley and you have a wonderful lunch or light dinner. Can you substitute another squash for butternut squash? You could make this soup with most winter squash, including pumpkin, delicata, acorn, or kabocha. If you don't care for squash, you could try roasting carrots or sweet potato chunks instead. Any vegetable that can be roasted and partially mashed would work here. This soup is both savory and slightly sweet (from the squash). Be sure to add some freshly ground black pepper, and taste test it before adding salt, depending on the saltiness of your broth. This month, the Soup Saturday Swappers are making soups with winter squash, a theme chosen by Ashley of Cheese Curd in Paradise. Before the recipe, check out the rest of the winter squash soups made by our group members. Preheat the oven to 425 degree F with a rack in the middle. Pile the squash and the onion on a rimmed baking sheet and drizzle with the oil. Toss the vegetables in the oil and spread them out into a single layer. Nestle the chicken thighs among the vegetables, skin side up. Sprinkle everything with salt and pepper. Roast everything in the oven for 40 to 45 minutes, until the chicken is cooked and the squash is tender. Set the chicken pieces aside to become cool enough to handle. 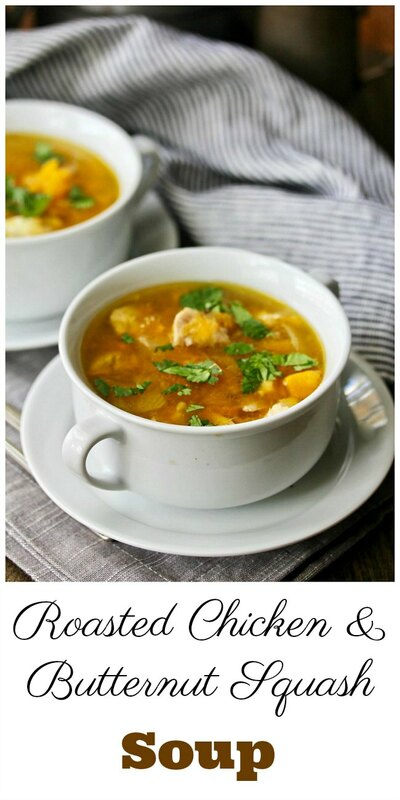 In a large saucepan, combine the squash, onions, and broth. Add the cumin and coriander and bring the mixture to a simmer. Using a potato masher, roughly mash the vegetables. There should be plenty of smaller chunks left in the soup. Remove the skin from the chicken and remove the meat from the bones. Either dice or shred the chicken and place it into the pot. Taste the broth and add salt and pepper to taste. Once again we are on the same page with chicken and butternut squash. Your soup sounds amazing Karen. This sounds great- I love the chunky style soup with this!